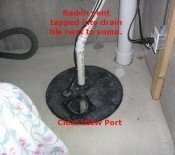 What is the proper radon vent pipe size to use? When in doubt you can never go wrong using 4"PVC Schedule 40 DWV, white drain and vent pipe. Black ABS Pipe is perfectly fine too. 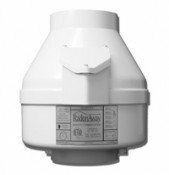 4" pipe will give you the flexibility to use a wide variety of radon fans. 4" is always recommended when high air flows are anticipated from gravel sub soils, drain tile and sumps with french drains. Schedule 20, thin wall piping is not recommended and not allowed in some regulated states. Schedule 40 is stronger, quieter and has a better R-value which will reduce condensation in the pipe which will keep your fan happier longer. When can 3" pipe be used? 3" pipe can be used for sand and tight soil conditions. Small basements (<1000sq/ft) with gravel, and drain tile can also be mitigated effectively with 3" pipe. But if you are designing a system with little experience 4" could save you by allowing for larger capacity fans to be installed. If you want to get your level well below 4pCi/L use 4" pipe just to be sure. Note: If you use 3" pipe make your hole in the floor 4-1/2" (4" pipe OD). A 3x4 PVC reducer will be used to go from the hole to the vent pipe. Otherwise you won't be able get your arm down the hole to dig properly.